Shane Lowry can’t wait to tee it up in this week’s Dubai Duty Free Irish Open after a racking up 17 birdies in the HNA Open de France in Paris. 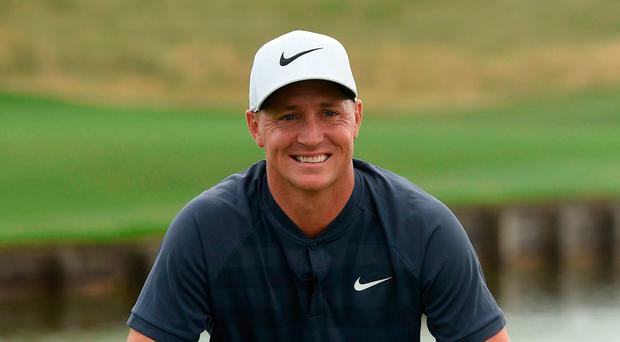 The Clara man (31) came back from three-over after two holes to close with a 70 at Le Golf National and finish tied for 16th on two-under par, just five shots behind winner Alex Noren of Sweden. “Getting closer,” tweeted Lowry, who feels his game is trending in the right direction as he heads to Ballyliffin for this week’s $7m Rolex Series event. Noren won’t be in Donegal but he must be one of the favourites for The Open at Carnoustie after he birdied two of his last three holes to claim his second Rolex Series title and his 10th European Tour victory. Seven behind compatriot Marcus Kinhult overnight, he closed with an impressive, four-under 67 to win by one stroke from American Julian Suri, Scotland’s Russell Knox and England’s Chris Wood on seven-under-par. It was another remarkable win for the Swede, who looks certain now to make his Ryder Cup debut in Paris in September. “If I would be on the team it would mean a lot,” said a delighted Noren, who is second behind Patrick Reed to the Race to Dubai. He looked an unlikely winner when he went to the turn in a pedestrian one-under par. But after birdies at the 12th and 16th, he made another at the 17th before parring the last for a 67 that set the target at seven-under par. It proved to be enough as the punishing finish to the Albatros Course at Le Golf National took its toll on the leaders with Suri, who was nine-under with four to play, following a bogey at the 15th with a double bogey at the 18th and Wood dropping shots at the 15th and 17th to leave them tied for third. With Noren already exempt, the three places in The Open at Carnoustie went to Knox, Suri and Kinhult, who slipped to a 76 to tie for fifth with Jon Rahm and Matthew Southgate on five-under. “When you’re out there you really want this win and it felt unbelievable to get it today,” said Noren, who shot 62 to come from behind to win last year’s BMW PGA at Wentworth. Paul Dunne finished tied for 21st on one-under after a 71 but Graeme McDowell’s week fizzled out disappointingly as he double-bogeyed the 16th and 18th and shot 72 to finish tied 37th on three-over. It was also a disappointing weekend for Seamus Power on the PGA Tour as he double-bogeyed the 18th hole to close with a second successive two-over 72 to finish on level-par at TPC Potomac. On the Challenge Tour, Michael Hoey produced a battling back nine to finish tied for fourth in the Made in Denmark Challenge at Himmerland Golf and Spa Resort. The five-time European Tour winner turned in four-over par but birdied three of his last four holes for a one-over 72, finishing seven shots behind Joachim B Hansen of Denmark, who closed with a one-under 70 to win by five strokes from Finland’s Kalle Samooja on 15-under. Ballymena’s Dermot McElroy shot a 70 to tie for 29th on two-under with Clandeboye’s Jonathan Caldwell tied 40th on level par after a 69. Meanwhile, Simon Thornton (Tulfarris Golf Resort) edged out Neil O’Briain (Old Conna GC) on the first play-off hole to win the Dubai Duty Free Irish Open qualifier at Rosapenna Hotel and Golf Resort. Thornton and O’Briain finished the 36-hole event locked together on five under par, while Moriarty ended the tournament on four under.